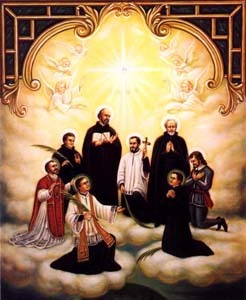 The following holy Jesuit mssionaries are the first martyrs in North America: Isaac Jogues, John de Brebeuf, Noel Chabanel, Anthony Daniel, Charles Garnier, Gabriel Lalamant, priests; and Rene Goupil and John Lalande. They were beatified by Pope Pius XI in 1925 and canonized by the same Pontiff five years later. Saint Isaac Jogues was born at Orleans, France, Jan. 19, 1607. After entering the Society of Jesus, he was appointed professor of literature at Rouen, and later was sent as a missionary to New France (now Canada). His zeal for converting the Indians led him amid continual hardships to penetrate as far as Sault Ste. Marie. As they were extremely superstitious and attributed the blighting of the crops or the advent of sickness to the presence of the missionaries, the latter were in constant danger of death. One time he and some companions were captured near Three Rivers, New York. Goupil was slain, and the others after severe tortures were condemned to death. But while preparations for their slaughter were in progress, they escaped, and Jogues returned to France. Though several of his fingers were mutilated, the Pope gave him permission to say Mass. In a few months, he returned to Canada and as a delegate arranged peace with the Indians. On his subsequent arrival among them, however, the crops were bad and the blame was put upon Fr. Jogues. They stripped and slashed and finally tomahawked him, October 18, 1646, at the town of Auriesville, NY, now a popular place of pilgrimage. Shortly after his death 3,000 Huron Indians were converted, much to the distress of the Iroquois. The latter seized his remaining companions and, after torturing them with arrows, boiling water and hot irons, put them to death. 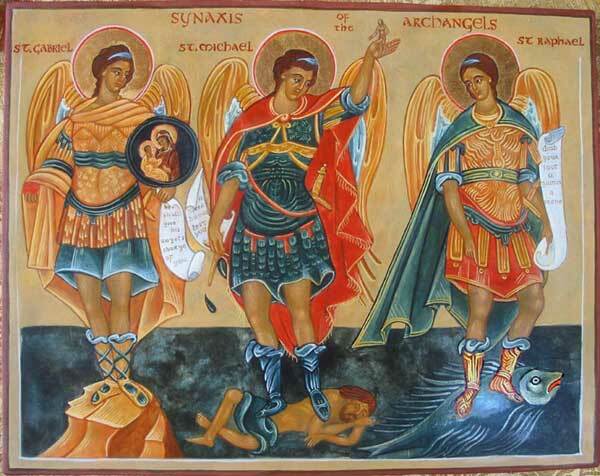 Reflection: Some are especially called to work for souls; but there is no one who cannot help much in their salvation by holy example, earnest intercession and the offering of actions in their behalf. Quotation: “My confidence is placed in God who does not need our help for accomplishing his designs. Our single endeavor should be to give ourselves to the work and to be faithful to him, and not to spoil his work by our shortcomings.” [From a letter of Isaac Jogues to a Jesuit friend in France, September 12, 1646, a month before he died].